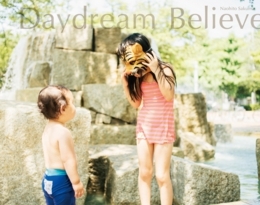 Naohito Sakuma Photobook "Daydream Believer"
I don’t want my friends to see us holding hands. Said, my daughter who is at the last year at kindergarten. Uttered with hesitance, which makes me realize something is going to end. And she suddenly looks very mature. I don’t want to forget this mysterious but fun days with her. I don’t want her to forget our time together. The time we spent together will slowly fade from our memory. Thinking about our growth, I decided to take pictures. She is a queen in a tiger mask. We can come across important things by looking at her in the pictures. By looking at her closely and distantly. As a father. As a man. Piles of time make us grow. 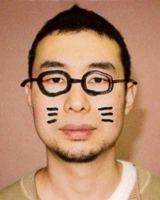 Everlasting dream that retains her true face under the tiger mask. But also the dream can deliver messages through the pictures. I like the eyes that capture the lights like a tiger. 2003　Solo exhibition「HAGOROMO」 NikonSalon, Shinjuku. 2004　Encore exhibition 「HAGOROMO」NikonSalon, Osaka. 「MEMBERS OF YOUNG PHOTOGRAPHERS EXHIBITION」Daegu,Korea.